The baby is sick, so no one is sleeping–and no one is cooking. 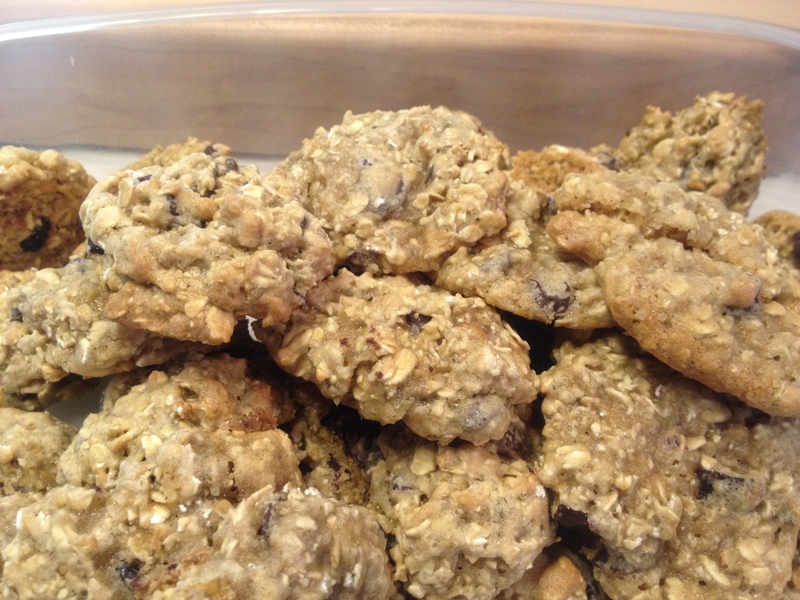 But J made breakfast cookies, which will surely be breakfast tomorrow. Yes, we call these Breakfast Cookies. They are our house’s specialty cookie. The name started as a joke, but–let’s be honest–is there a time of day when a cookie doesn’t sound delicious? Why NOT for breakfast? Anyway, they can be varied with different dried fruits and nuts, and we always bake some without chocolate for the child in our family who doesn’t like chocolate (I know, it’s crazy, but we have one). I like raisins and walnuts, myself. The kids like dried cranberries. We were out of both of those dried fruits, but luckily Cherry Chocolate Chip Breakfast Cookies aren’t half bad. To make a huge mountain of them (for a small mountain, halve the recipe), mix together 1 c. brown sugar, 1 c. granulated sugar, 1/4 c. canola oil and 1/4 c. applesauce, then mix in 2 eggs, 2 tsp. vanilla, and 2 Tbsp. milk. In a separate bowl, combine 2 c. flour (you can use part whole wheat), 1 tsp. baking soda, 1 tsp. baking powder, and 1 tsp. salt. Mix these dry ingredients into the wet ingredients. Adding them a cup at a time, work 4 c. oats into the dough. Mix in 1 c. chocolate chips, 1 c. dried fruit and 1 c. chopped nuts (or whatever chocolate/dried fruit/nut combo sounds good to you). Bake at 350 until the tops of the cookies are almost completely dry (how long to cook them depends on the size; we usually cook 2-Tbsp. mounds of dough for about 10 minutes). The cookies will be soft but you can leave them on the cookie sheet to cool for a crispy bottom. This entry was posted in Baking, Breakfast, Cookies, Desserts, Easily Multiplies to Feed a Crowd and tagged baking, breakfast, dessert, recipes on January 12, 2012 by emmycooks.